Congenica and Edico Genome said today they will offer their complementary platform technologies as a single genome data analysis solution, with the goal of helping clinical labs and hospitals accelerate their progression from DNA sequencing to diagnosis for inherited diseases. The value of the collaboration was not disclosed. The new offering—which the companies said was available immediately—will combine Congenica's SapientiaTM software platform with Edico Genome's DRAGENTM processor. DRAGEN uses a field-programmable gate array (FPGA) to provide hardware-accelerated implementations of genome pipeline algorithms. Its features include optimized, hardware-based algorithms for mapping, alignment, sorting, and variant calling. 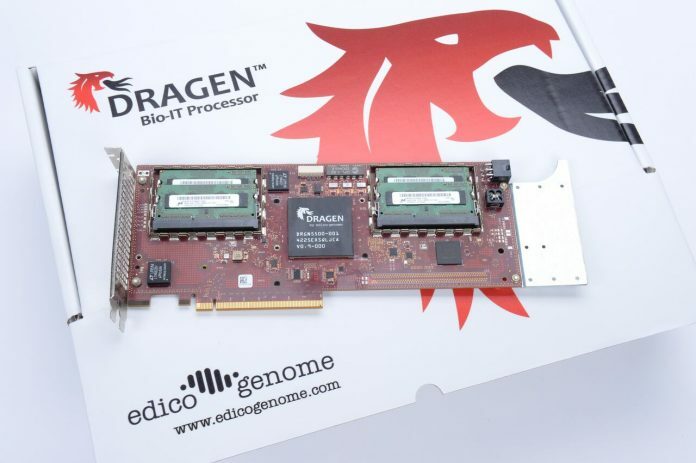 According to Edico, DRAGEN can analyze a whole genome in only 20 minutes onsite, or under 10 minutes in a single cloud instance. “Through this new collaboration, we're able to create an all-in-one, easy-to-use offering that significantly accelerates the ability of hospitals and clinical labs to move from the sequencing of a sample to a clinical diagnosis,” Edico Genome CEO Pieter van Rooyen, Ph.D., said in a statement. Edico cited the experience of University College London's (UCL) Rapid Paediatric Sequencing Project, which is using DRAGEN in a pilot study assessing rapid whole genome sequencing for rare diseases in an intensive-care clinical setting. “Initially, we will apply the technology to a number of clinical cases where rapid turnaround is especially critical, and ultimately envisage that the solution will be widely used as we scale our efforts,” stated Phil Beales, professor of medical and molecular genetics at UCL. Headquartered in Cambridge, U.K., Congenica was founded by pioneering researchers from the Sanger Institute. Congenica’s Sapientia is a cloud-based integrated software platform designed to analyze and interpret genetic data linked to patients' phenotypes; then create comprehensive diagnostic reports, to support clinical decision-making by hospitals and labs. Sapientia handles the main data input—including BAM, VCF, and FASTQ files in many upload formats—and offers the added flexibility of integrating and managing customer legacy data to enhance diagnostic capabilities. Sapientia is used throughout the U.K.’s National Health Service, as well as by clinical scientists providing reports for the 100,000 Genomes Project, the U.K.’s effort to catapult itself to global leadership in genetic research into cancer and rare diseases. “By combining our complementary technologies, we aim to accelerate the clinician's ability to use genomics to diagnose a patient's disease, and make this available on a global basis,” added Congenica CEO Thomas Weaver, Ph.D.